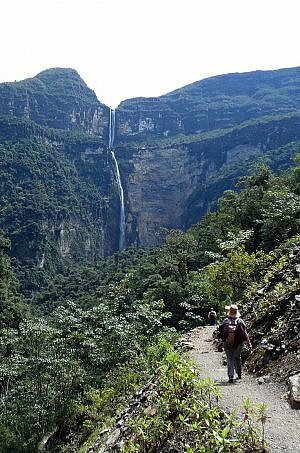 Some of the best places to visit in the world make you work for it a bit and that’s true with Gocta Waterfall in Peru. You’ll go up and down for six kilometers each way on the trip, but after you get there you may have the waterfalls all to yourself. I use the plural because it’s really Gocta Waterfalls: there are two sections spilling down from a high cliff, dropping approximately 771 meters (2,531 feet) in all, though this number published by National Geographic has been disputed by some. 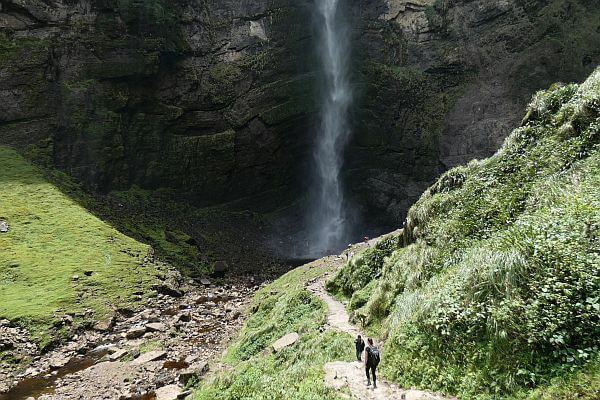 Depending on who you ask, Gocta Falls are probably somewhere between the third and sixth longest waterfalls in the world when combined. 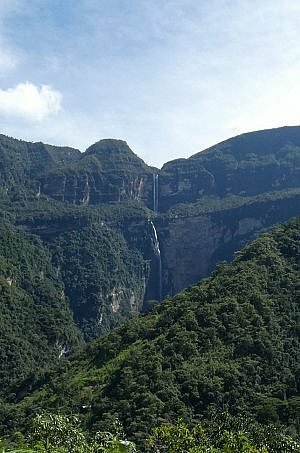 So no, this isn’t close to being the highest waterfall in the world—that would be in troubled Venezuela—but it’s not important really. No matter where this one ranks, it’s an impressive sight from a distance or up close. It’s also “waterfalls” plural though because there are others coming down from various other cliffs as well. 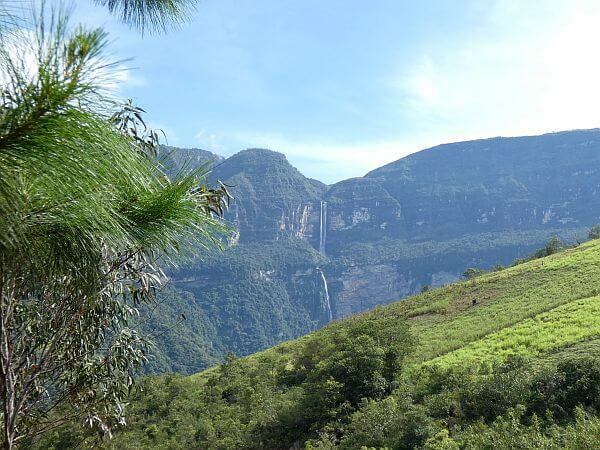 The scenery in this Chachapoyas region of north Peru is beyond stunning. Even if you removed the falls, a hike around here would be worth taking just for the cliff and mountain views. To get to Gocta, you first arrive by some kind of transportation to the village of Cocachimba. If you’re on an Amazonas region tour (like I was with Viajes Pacifico) then just kick back and enjoy the ride. Otherwise you’ll need to join up with a tour from Chachapoyas City that will cost $20 to $30 depending on what’s included. Not a bad deal either way for something this spectacular to see. The odd thing is, these villagers knew about the Catarata del Gocta for generations, but no foreigner set eyes on them until 2002. There was no trail to get to them because of all kinds of legends and superstitions involving mermaids and nasty beasts. In short, the Cocachimba villagers thought whoever visited the falls would not come back. The German explorer who “discovered” the place and group of guides did come back, however, after walking along the river all the way to the base in 2006. Then in 2007 a consortium of Italian and Peruvian groups cut a trail through the jungle so the public could visit the attraction. You pay 10 Peruvian soles (currently around $3) to enter the trail and the whole trip is four to six hours depending on your speed and how long you hang around after you get there. You get multiple views of the waterfall along the way, so you have plenty of chances for a safe selfie if you want one. Better to do it from a safe spot on the trail: one Korean tourist died in 2006 after getting too close to a ledge while photographing himself. He was found dead in the water at the bottom. The hike is along a trail that’s in the sun about half the time, so put on sunscreen and bring water to drink. There’s clear stream water coming from springs to drink along the way most of the year, though it is probably a good idea to bring a travel water purifier to be safe. I had a Grayl one with me, which I clipped onto my daypack. 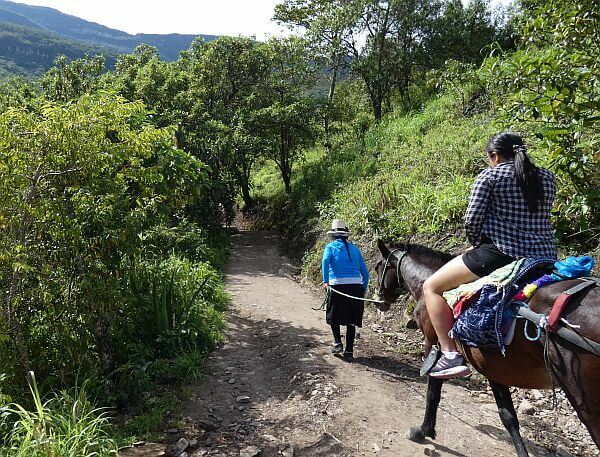 If you have limited mobility, you can still get to the base of the waterfalls by hiring a horse for 40 soles, or around $13. The horse will be led by a local villager who walks along in front of you, leading the beast of burden along. It was a rather comical sight though when I was there: a woman in her 20s was on horseback, led by a villager Paulina who was 72 years old. After a good workout that goes up and down a lot, with some flat spots in between, you have this one last view from a distance before approaching the source of the roaring sound. The falls themselves are thunderous and misty much of the year as it rains a lot in this Amazonas region of Northern Peru. I had to continually wipe my camera lens off as it kept getting hit by droplets, even when I was a hundred meters back. There is a relatively flat section at the end of the trail, or you can hike up a little and get to a ledge that overlooks the pools. 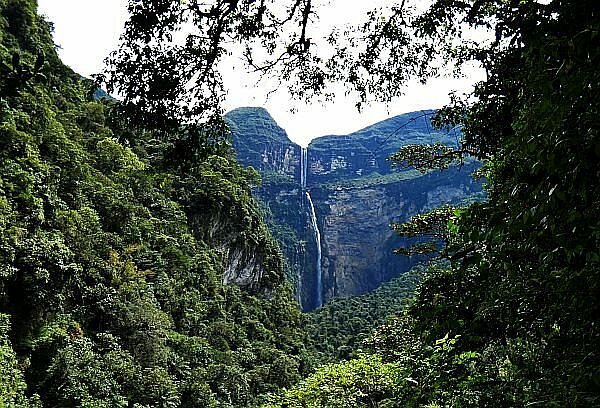 While you can see both sections of Gocta Waterfalls from a distance, up close you can only see the bottom half. It’s a hard waterfall to photograph as well because the sun moves across the top of it during the day. There doesn’t seem to be an ideal time to be there when the sunlight hits at a good angle. So don’t bring a red dress along thinking you’re going to be the queen of Instagram once you get there. You can’t sleep at the falls themselves and you need to allow at least two hours to get back to the village to avoid having to walk the rocky trail in the dark. There are some places to stay in Cocachimba, however, so if you’re traveling independently instead of just on a day tour from Chacapoyas City, you can rest your weary legs where the trail starts instead of enduring hours in a van. 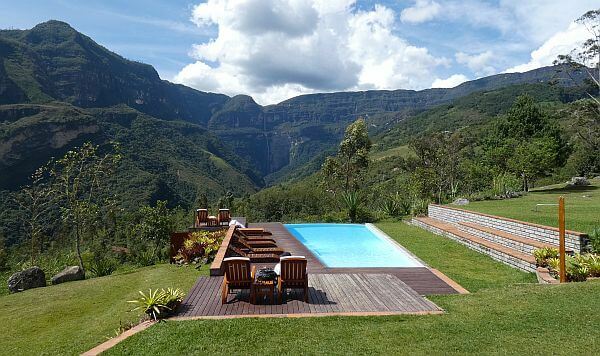 If you don’t stay there, you can at least come to Gocta Lodge for a meal and have the views of the waterfalls and Peruvian mountains from the outdoor dining area. They even have some craft beers to choose from. Otherwise, you can find six or seven other hotels available, ranging from $15 (Gardenias de Gocta) to $120 per night for a double, some including breakfast. 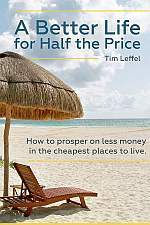 The best selection is usually on Booking.com. There are a few options on Airbnb, but most of them on there are just the hotels listed on the regular booking services, with a few houses in the mix. This is not a big village at all. Choices and prices are much better in Chachapoyas. 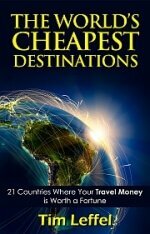 How do you get to this Amazonas region? Well, there’s a reason there are not many foreign tourists around. You fly to the city of Jaen from Lima, then it takes about four hours to reach Chachapoyas on a winding road. The scenery along the way is spectacular though, then it gets even better around Gocta Falls. Check flight prices at Skyscanner and if you’d like to let someone else take care of all the details on your Peru trip, this Ultimate Peru journey from Intrepid hits the north and the south over the course of 15 days. This is a really lovely and beautiful place…Wouldn’t miss this place if I ever went over there!! This is really amazing and the way you captured it make it more beautiful. Thanks for your kind info I am really looking forward to see and experience it.